If this e-mail does not display properly, please view our online version. To ensure receipt of our e-mail, please add localhistorynews@mnhs.org to your address book. Please do not reply to this automatic e-mail. The grant helped fund repointing of masonry and restoration of the first floor façade and architectural details on the Stranger's Refuge Lodge #74 IOOF, listed in the National Register of Historic Places, which is being reused as the public library. Pre-application comments for the Heritage Partnership Program will be emailed to project directors within the next week. Applicants must revise proposals and submit completed final applications submitted via the grants portal by March 7, 2014. Organizations must have completed and submitted a pre-application in order to be eligible for the final application process. Contact the Grants Office with questions. The deadline to apply for Minnesota Historical Society's Grants Office Manager position is this Friday, February 14, 2014. An assessment of Legacy Amendment accountability. Good news for Washington County Historical Society. Tree Party tells local history through song. The history behind Black History Month. Boston College's troublesome oral history project. 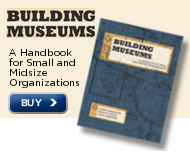 Small museums can think big; it's a matter of scale. The connection between public and environmental history. Does your disaster plan include recovery from sinkholes? National Park Service seeks temporary Park Ranger at Keweenaw National Historical Park, Calumet MI. Deadline: February 19, 2014. Mower County Historical Society, Austin MN, seeks Photo Inventory Assistant for grant-funded project position. Deadline: February 21, 2014, 4 p.m.
Abraham Lincoln Presidential Library and Museum, Springfield IL, seeks Director of Education. Deadline: February 28, 2014. Chisago County Historical Society seeks part-time Executive Director. Submit resumes to CCHS, PO Box 146, Lindstrom, MN 55045. Deadline: February 28, 2014. The Henry Ford, Dearborn MI, seeks applicants to the Simmons Internship Program. Deadline: March 3, 2014. Field Museum, Chicago IL, seeks Collections Assistant, Anthropology Collections Digitization. Herbert Hoover Presidential Library & Museum, West Branch IA, seeks Curatorial Interns for the Spring and Summer. Rolling deadlines; email cover letter, resume, and two recommendation letters to Melanie Wier. Landmark Center, St. Paul MN, hosts Northern-Scapes art exhibit, February 11-22, 2014; first floor North Gallery. Free. Winona County History Center, Winona MN, hosts poet Ken McCullough will share 45 years of love poems, Thursday February 13, 2014, 7 p.m. Call 507-454-2723 for more information. Landmark Center, St. Paul MN, presents Cocktails with Culture, Thursday February 13, 2014, 5-7 p.m.
Rice County Historical Society, Faribault MN, hosts Dale Maul, who will present a three-part series on the anthropology of the Rice County area, Thursdays, February 13 and 27, and March 14, 2014. Fee: $20/full series, or $10/lecture. Seating is limited; call 507-332-2121 for more information. Otter Tail County Historical Society, Fergus Falls MN, opens a new exhibit, "Veterans of the Civil War," Friday February 14, 2014, 4-7 p.m. Call 218-736-6038 for more information. Carlton County Historical Society, Cloquet MN, hosts Mark Wick, who will present a program on "The Steamer 'America,'" Saturday February 15, 2014, 11 a.m. Call 218-879-1938 for more information. Hamline Midway History Corps will meet Saturday February 15, 2014, 2-4 p.m. at Ginkgo Coffeehouse, St. Paul MN. St. Cloud Area Genealogists' Meeting takes place Tuesday February 18, 2014, 7 p.m., at Stearns History Center, St. Cloud MN. Local genealogist Dan Schroeder will discuss familial relations and understanding your family tree. Contact Dan Schroeder, 320-685-3629, for more information. Wright County Historical Society, Buffalo MN, announces the return of their popular Seed Swap Event, Tuesday February 18, 2014, 1:30-3 p.m. Contact Sally Stevens, 763-682-7323, for more information. White Bear Lake Area Historical Society, White Bear Lake MN, hosts "Then & Now: Downtown White Bear Lake Part I," Wednesday February 19, 2014, 2 p.m., Ramsey County Library-White Bear Lake. Call 651-407-5327 for more information. Brooklyn Historical Society, Brooklyn Park MN, invites the public to their Annual Meeting for the showing the documentary "From Wasioja to Washington," Thursday February 20, 2014, 3:30 p.m., Hennepin Technical College, Brooklyn Park. Call 763-536-0842 for more information. Steele County Historical Society is again hosting this year's Worlds of Flavor Food & Brewfest on the 21st of February. Get your tickets today. Stearns History Museum, St. Cloud MN, hosts a Cabin Fever Reliever, Saturday February 22, 2014, 10:30 a.m. to 2 p.m. Family-friendly indoor and outdoor activities. Call 320-253-8424 for more information. Wadena County Historical Society invites the public to come play in the past at Living History Day, Saturday February 22, 2014, 1:30-4:30 p.m. Free family-oriented fun. Call 218-631-9079 for more information. Dakota County Historical Society, South St. Paul MN; and Friends of LeDuc of Historic Hastings, Hastings MN, host their first Authors' Sunday of the year, on Sunday February 23, 2014, 1 p.m. Featured author will be Joel Arnold of Savage MN, who wrote "Ox Cart Angel." Call 651-437-7055 for more information. Ramsey County Library-White Bear Lake hosts Fletcher Driscoll, who will discuss the history of the White Bear Boat Yard, Monday February 24, 2014, 6 p.m. Presented by White Bear Lake Area Historical Society. Call 651-407-5327 for more information. Ramsey County Library-Maplewood hosts a program on "Beer and Brewing in the Land of Sky Blue Waters," Tuesday March 4, 2014, 7 p.m. Call 651-724-6022 for more information. Ramsey County Library-Maplewood hosts a program on "Boozy Ballads and Temperance Tunes," Wednesday March 12, 2014, 7 p.m. Call 651-724-6022 for more information. Brown County Historical Society, New Ulm MN, is sponsoring their annual Kitty Lieb Historical Essay Contest, open to anyone ages 16 and up. Entries must be historical and nonfiction. Deadline: Friday March 14, 2014. Contact Meghan, 507-233-2616, for more information. AASLH offers Project Management for History Professionals, a two-day workshop at Arizona Historical Society, Tempe AZ, March 13-14, 2014. Register by February 13, 2014 to receive discounted rate. The 2014 Nonprofit Technology and Communications Conference will be held April 10, 2014, Hyatt Regency Minneapolis, 7:30 a.m. to 4:30 p.m. Early bird registration due by March 4, 2014. Mormon Trail Center at Historic Winter Quarters, Omaha NE, hosts the AASLH Collections Management and Practices Workshop, June 12-13, 2014. Cost: $270/members; $345/nonmembers. Early bird discount if fee is received by May 8, 2014. Iowa Museum Association announces a call for proposals for their annual meeting, "Passionate People Creating Vibrant Communities," October 12-14, 2014, Cedar Rapids IA. Deadline: March 10, 2014. The Internal Revenue Service offers a phone forum for Form 990-N and 990-EZ filing tips, February 20, 2014, 2 p.m. ET. History Matters Day at the Capitol will be Monday March 10, 2014. Come advocate for Minnesota history! Looking for a contractor who knows how to restore old masonry or windows? How do you find a museum consultant or historian? Search the Online Preservation Specialists Directory from Minnesota's State Historic Preservation Office! The directory lists preservation- and history-minded specialists who are interested in working on Minnesota projects. The Oliver H. Kelley Farm, a National Historic Landmark, is ready to serve more schoolchildren and tourists with a solid plan for expansion and revitalization. Please lend your support; contact your legislator now. Do you know someone who is skilled in reading shorthand from the early 1900s? A historical organization in Minnesota needs your help! Contact Marian Rengel, 320-308-5625, for more information or to volunteer. National Park Service offers Rivers, Trails, and Conservation Assistance Program to state and local agencies, tribes, nonprofit organizations, and citizen groups. Deadline: August 1, 2014. It's Black History Month in Minnesota! Frank White, a community scholar, baseball historian, and member of the Minnesota State Historical Records Advisory Board, will lead tours behind the scenes of his exhibit "They Played for the Love of the Game." Black baseball in Minnesota is hugely significant with players on barnstorming clubs or individually hiring themselves out to play on many town clubs across the state. Their integrity and sportsmanship sometime stood in contrast to their reception, and sometimes did much to foster understanding. We stand in awe of all they accomplished for us. Read more at the Star Tribune. Apply for an AASLH Leadership in History Award. Contact the AASLH MN State Representative, Joe Hoover, for more information. Scholarships are available to the 2014 AASLH Conference, St. Paul, MN. Deadline: April 11, 2014. Lincoln and the Indians: Civil War Policy and Politics, by David A. Nichols. Published by Minnesota Historical Society Press. Happy 205th Birthday to President Abraham Lincoln! The Minnesota Local History Services Office, a service of the Minnesota Historical Society since 1916, assists local historical societies, museums, libraries and archives to preserve and make accessible Minnesota history and cultural heritage.